On Friday, September 26, Central Tech officially celebrated the grand opening of the new Industrial and Safety Training Center on the Sapulpa campus. With industry placing a strong emphasis upon safety in the workplace, thus decreasing workers’ comp and increasing productivity, combined with the ever present need for advanced technical skills in the workforce, a necessity for rigorous training has emerged. The new training center positions Central Tech to best meet the training needs of local business and industry, keeping their current and future workforce up-to-date on technical skills. 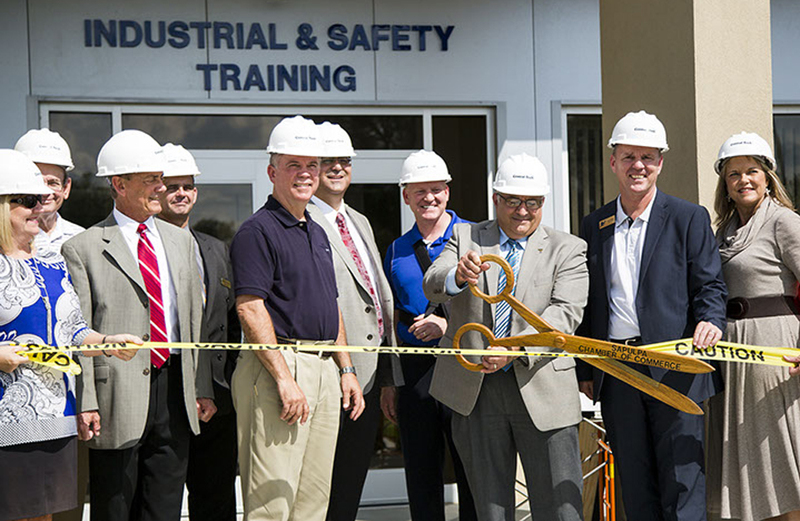 With the current low unemployment rate, “expanding companies in the area have a tough time finding skilled applicants, the new training center will support local companies by providing industry specific training, allowing companies to remain competitive in the worldwide market,” said Mark Cotner, Central Tech industrial training coordinator. The other section of the building is dedicated to the new Heating, Ventilation and Air Conditioning (HVAC) program which began instruction in August. As with many industries, HVAC, is experiencing a shortage of qualified technicians to replace the aging workforce. According to the Air-conditioning, Heating and Refrigeration Institute (AHRI), an estimated additional 57,000 skilled workers are needed each year. “We plan to minimize the gap and train technicians with high-level skills in HVAC so they can secure good jobs with a competitive income,” Waul said. The training center is approximately 16,400 square feet, including 11,000 square feet of shop and lab space. Along with housing the HVAC program, the training center includes a confined space training area, three large classrooms, computer lab, conference room and a flexible multiuse space. Central Tech’s Business and Industry Service department customizes training programs to meet specific needs of local business. Current classes include forklift, overhead crane & rigging, CPR, OSHA certifications, and many more. Central Tech is also expanding classes in hydraulics, pneumatics, electrical and electronic/PLC. Central Tech invites the public to tour the new Industrial & Safety Training Center, as well as the rest of the campus, during the 45th annual open house on Sunday, February 15th, 2015, from 1-4 pm. Central Tech is a proud member of the Oklahoma CareerTech System and serves more than 22,000 annual enrollments and providing customized business and industry training to more than 500 area businesses. For more information, please visit CentralTech.Edu. Joe Naifeh, Central Tech Board of Education President, cuts the ribbon, opening the new Central Tech Industrial and Safety Training Center on the Sapulpa campus on Friday, Sept. 26. Along with Naifeh, (L-R) Susznne Shirey, David Main, Phil Waul, Mark Cotner, Dave Roberts, Kim Howard, Kevin Burr, and Cindy McDonald.